Clarice Feldman posted an article at The American Thinker today highlighting things that will be in the news in the coming week. That’s not as much of a challenge as it sounds as many of these stories were breaking late Friday and early Saturday. The first story deals with the recent budget fiasco. Specifically, Mr. Ryan likes the idea of paring back the huge spending hikes in the recently enacted budget bill. While the budget required 60 votes in the Senate and therefore Democratic support, a “rescission” bill to repeal the spending increases needs only a simple majority in each house. If the Republicans plan to remain in the majority, they have no choice but to cut this budget. Otherwise the conservative wing of the party will happily vote them out of office for reneging on every promise they made while running for office. The second story to watch for will be the beginning of criminally prosecuting illegal aliens as they cross the border. Crossing the border is no longer going to be taken lightly. The third story is the end of the standoff between Congress and the FBI and DOJ. This will probably lead to the declassification of the FISA applications. That will probably tell us all we need to know about the Russian collusion investigation and its roots. The final news article for the coming week will be information about the investigation of the Clinton Foundation. The story of the Clintons’ misuse of charity solicitation, reporting, and accounting laws begins in 1997 and continues on past Clinton’s term as president where people familiar to us in the present DOJ-FBI investigations failed to prosecute the Clintons for obvious charity fraud and violation of federal and state law on charitable solicitations. The most recent investigation of the Clinton foundation took place under Rod Rosenstein, then U.S. attorney for Baltimore. He utterly flubbed the task, as Ortel (Charles Ortel, a retired investment banker) notes. …At the moment, some state attorneys general are investigating Clinton foundation fraud and illegality. So are some foreign governments whose laws were violated by the foundation. While in the U.S. opportunities to prosecute longstanding frauds may be barred by the passage of time and the statute of limitations, this latest Clinton-Bush Haiti Fund transaction seems not to be. If I were to speculate, I’d suggest that it is not unlikely (now that the Clintons are fairly politically neutered) that whistleblowers inside the foundation, the donors’ offices, and the government – particularly the IRS – may come forward, at long last, to expose the frauds which Rosenstein, Mueller, and Comey seem to have lacked the integrity and guts to do. On Thursday, The Hill reported that on May 25th the Radcliffe Institute for Advanced Study at Harvard University was going to present Hillary Clinton an award that recognizes individuals who have had a “transformative impact” on society. I assume the award may be conditional based on whether or not she is in jail by then. “Hillary Clinton’s life and career are an inspiration to people around the world,” Radcliffe Institute Dean Lizabeth Cohen, who teaches American studies at Harvard, said in the press release. The event in May will feature a tribute to Clinton delivered by friend, former secretary of State and fellow Radcliffe medalist Madeleine Albright, according to the release, as well as a conversation between Clinton and Massachusetts Attorney General Maura Healey (D). Clinton, who ran unsuccessfully against President Trump in 2016, was the first woman to secure a nomination for president from a major political party in the United States. “We commend Secretary Clinton for her accomplishments in the public sphere as a champion for human rights and the welfare of all,” Cohen said. Yes, Mrs. Clinton was the first woman to run for President. Based on what? She was elected a Senator from New York on the basis of her husband’s popularity. She rigged the Democratic primary election to become the candidate. The jury is still out on the corruption in the Clinton Foundation (although that may come to a head very soon). She obviously mishandled classified information in a way that would have put other people in prison. The list of scandals that has followed the Clintons since the 1990’s is almost endless. And this is the woman Harvard is choosing to honor. I will admit that Hillary Clinton has been transformative in that she has transformed the meaning of the word ethical. When It Hits The Fan, Who Do You Throw Under The Bus? The investigation into the unlawful surveillance on the Trump campaign and transition team is beginning to uncover the things the deep state did to keep Donald Trump from becoming President and to hinder his presidency after he was elected. Other Clinton scandals have also surfaced—Uranium One, relief to Haiti, the Clinton Foundation and pay-to-play, etc. So what is the logical conclusion to all of this investigating? Tuesday night I had the chance to hear a conservative speaker who belongs to a watchdog group speak about the deep state. At the end of his presentation, a person in the audience asked him if he thought anyone involved in the deep state efforts against Donald Trump would ever go to jail. He said he didn’t think so. The person then asked if there are no consequences for illegal deep state activity, how do we end such activity. The speaker then reminded us that the purpose of the deep state was to prevent Donald Trump from becoming President and to remove him from office if he did become President. The speaker stated that he felt that if those efforts failed, it would discourage those in the deep state from trying this again. I really did not like that answer. Frankly, I would like to see some people go to jail, but I am not sure I am being realistic. The history of Special Prosecutors is that someone goes to jail. The person who goes to jail does not have to be someone directly involved in whatever initial crime was involved, but can be someone tangentially related to whatever is being investigated. The Clintons were never charged with any crime. Fifteen other persons were convicted of more than 40 crimes, including Jim Guy Tucker, who was removed from office. As you can see, Special Prosecutors tend to send people to jail. It will be interesting to see if things have changed. So, if someone is to be thrown under the bus for spy gate, Uranium One gate, or the other scandals involving the Obama Administration and the Clintons, who will it be? It needs to be someone considered unlikely to turn state’s evidence—someone who will limit the damage to President Obama and Hillary Clinton. If the Clinton’s follow their past pattern, it will be someone who will be appreciative of financial support for their family magically appearing while they are in jail. 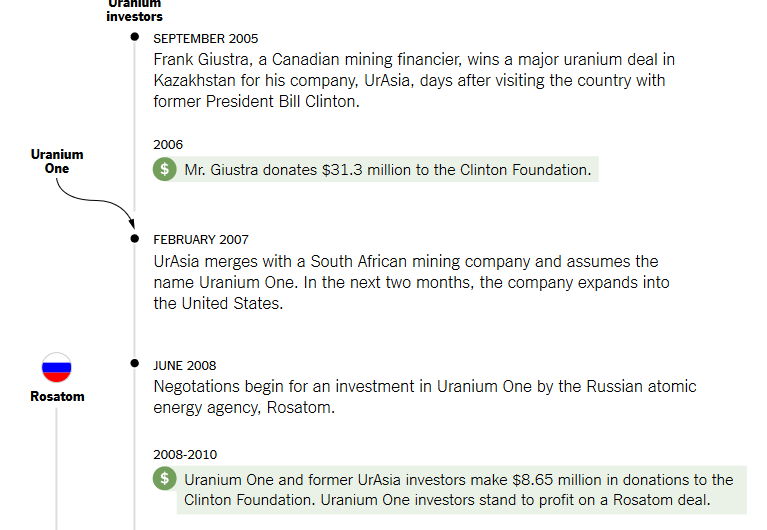 On April 22, 2015, The New York Times posted an article about the Uranium One deal. Yesterday, according to an article posted at The Hill, Douglas Campbell, an FBI informant, testified to three congressional committees via a written statement. An FBI informant connected to the Uranium One controversy told three congressional committees in a written statement that Moscow routed millions of dollars to America with the expectation it would be used to benefit Bill Clinton‘s charitable efforts while Secretary of State Hillary Clinton quarterbacked a “reset” in U.S.-Russian relations. Maybe I’m missing something, but it seems as if Mr. Campbell’s statement simply reiterates what The New York Times told us almost three years ago. The Democrats, of course, will be trying to discredit what Mr. Campbell has said, but again I don’t see how they will have any credibility because of the New York Times article. But Campbell said he was gratified when the FBI in 2016 gave him a $50,000 reward check celebrating his undercover work, directly answering Democrats criticisms that federal prosecutors didn’t trust him as a witness. “My FBI handlers praised my work. They told me on various occasions that details from the undercover probe had been briefed directly to FBI top officials. On two occasions my handlers were particularly excited, claiming that my undercover work had been briefed to President Obama as part of his daily presidential briefing,” he said. In the end, though, he told lawmakers he remains disturbed that the Obama administration made so many favorable decisions benefiting the Russian nuclear industry when the evidence of wrongdoing and ill intent was so extensive. This is a troubling list of events. It sounds as if even The New York Times was willing to post an article about what was going on. This is another situation where the Clinton Foundation received donations related to matters involving the government at critical times. The events also raise some questions about the FBI–why weren’t they shouting from the rooftops when this was going on? Isn’t their oath to America–not to any one administration? It’s hard to get the job done when the person you are investigating won’t talk to you! The following video posted at YouTube is of State Department Inspector General Steve Linick testifying before the House Oversight Committee on July 7th, 2016, in which he revealed Hillary Clinton refused an interview request related to her email investigation. Chaffetz: Were you able to interview Hillary Clinton? Linick: Well, we asked to interview secretary Clinton. We interviewed all of the secretaries. We looked at five Secretaries of State going back to Madeleine Albright and her, through counsel, she declined to meet with us. Chaffetz: Did she indicate a reason why she would refuse to meet with the inspector general? Linick: Her counsel informed our staff that she had — that all of the information about the e-mail was on the FAQ she published by her campaign. Howard Krongard, the State Department Inspector General from April 2005 to January 2008, told Fox News last May that Clinton did not follow standard practices in respect to private email usage. “I would have been stunned had I been asked to send an email to her at a personal server, private address. I would have declined to do so on security grounds and if she had sent one to me, I probably would have started an investigation,” added Krongard. From what I have seen, I suspect that the emails are the least of Hillary Clinton’s worries about the Inspector General’s report. It is very obvious that laws were broken in Ms. Clinton‘s handling of classified information. It is also very obvious that an ordinary citizen would be in jail for similar crimes. I don’t necessarily wish Ms. Clinton jail time, but it would be nice to see her admit that she broke the law. If her email account was used to funnel money to the Clinton Foundation in return for political favors, she should be heavily fined and forced to return the money. The Inspector General’s report is due out in January. It should be very interesting. Yesterday The Hill posted an article detailing some of the recent research done by John Solomon and Alison Spann on the Uranium One scandal. 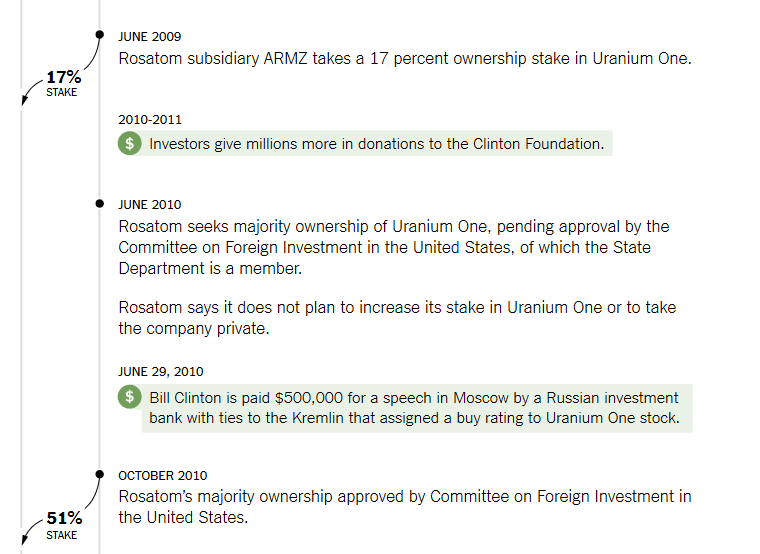 It seems that a lot more money changed hands in the transactions surrounding Uranium One than was originally reported by the Clintons. For instance, an internal CGI document prepared in fall 2011 lists APCO’s in-kind contribution at $275,000 for that year alone. And APCO’s annual report on its global charitable efforts boasted of a large jump in support for CGI in 2011. The increase in the contributions came as APCO was paid $3 million in 2010 and 2011 to work for Rosatom, Russia’s state-owned nuclear company. Rosatom paid APCO to lobby the State Department and other federal agencies on behalf of its Tenex subsidiary, which sought to increase its commercial uranium sales in the United States. In 2010 and 2011, APCO made more than 50 contacts with federal and congressional figures for Tenex, including at least 10 at the State Department, its foreign agent disclosure reports show. It seems as if there was an awful lot of money changing hands for this to be an ordinary business transaction. Undercover FBI informant William Campbell helped uncover the transporting of some of the uranium outside of the United States. He is expected to be interviewed in the near future by multiple Congressional committees. One can only hope that he stays safe until those interviews take place. Please follow this link to read the entire article. It is a shining example of what the Washington swamp looks like. Also, please understand that if Hillary Clinton had been elected, all of this information would have remained buried. What we are watching now–the Uranium One scandal and the fall of many prominent news anchors and other public figures is the result of the Clinton family losing power and influence. The Clintons can no longer protect their former allies. It remains to be seen if the Clintons can even protect themselves. Breitbart posted an article today about donations to the Clinton Foundation since the 2016 election. The latest tax filings released by the foundation a week ago showed that contributions dropped 42 percent in 2016 from $108 million to $63 million—right around the time Clinton lost last year’s presidential election, according to the New York Post. Donations tanked by 37 percent in 2015 after the organization tried to fend off allegations that Clinton had used the foundation to engage in pay-to-play schemes with foreign governments. The former 2016 Democratic presidential nominee allegedly used the charity to solicit millions of dollars in donations from foreign governments and corporations in exchange for giving these entities favorable treatment while she served as Secretary of State. The Justice Department announced Monday that the agency is weighing whether to appoint a special counsel to investigate the millions of dollars in Clinton Foundation donations tied to the Uranium One deal, whereby the Obama administration permitted a Canadian company called Uranium One to sell one-fifth of America’s uranium to Russia in 2010. I don’t wish anyone ill, but the rumors of misuse of funds in the foundation have been around for years. In September 2015, Politico posted an article about the Clinton Foundation’s activities in Haiti. Anyone who has done some basic research quickly discovers connections between donations to the Clinton Foundation and State Department decisions. There is reason to believe that if Hillary Clinton had become President those connections would have appeared at the executive level of our government. Therefore, it is not a surprise that as the influence of the Clinton family is waning, the donations to the Clinton Foundation are dropping. That’s not really rocket science. Regardless of your stand on whether or not the Uranium One sale is a problem, you probably agree that it’s a bad idea to ship uranium that can be upgraded for weapons use out of America. One of the talking points the left is using to say that the Uranium One deal is not a problem is to say that since the uranium is not allowed to leave America, it really doesn’t matter who owns it. Well, it seems as if that is not the case. Yesterday The Hill reported that uranium that can be upgraded for weapons use did leave the country. A year later, the nuclear regulator repeated the assurance in a letter to Sen. John Barrasso, a Wyoming Republican in whose state Uranium One operated mines. 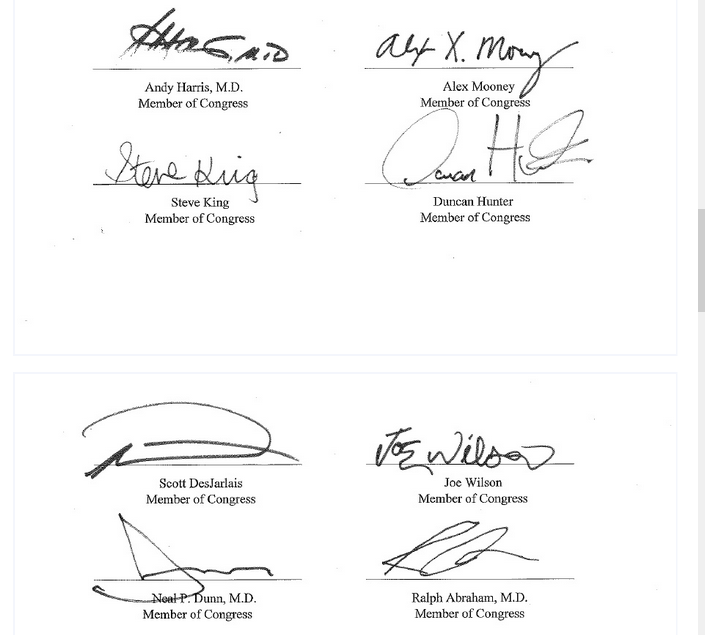 …Yet NRC memos reviewed by The Hill show that it did approve the shipment of yellowcake uranium — the raw material used to make nuclear fuel and weapons — from the Russian-owned mines in the United States to Canada in 2012 through a third party. Later, the Obama administration approved some of that uranium going all the way to Europe, government documents show. The move escaped notice in Congress. Please follow the link above to The Hill to read the entire article. It details how things were done to avoid attracting the attention of Congress and to avoid Congress exercising the oversight role it should have played in this series of transactions. The Hill posted a very disturbing article today about a deal with Russia that was made during the Obama Administration. Evidently the Department of Justice slow walked an investigation that had been done by the FBI and did not brief Congress on the investigation in a timely manner. It pays to donate to the Clinton Foundation. Or at least it did. This is the swamp that needs to be cleaned out. Anyone involved in this investigation and the fact that it was kept secret from Congress needs to be unemployed immediately. Please follow the link to the article and read the entire story and review the documents involved. This story is an example of government corruption and that corruption needs to have consequences for those involved. I have previously posted articles about the bias that seems to be part of Special Prosecutor Robert Mueller‘s investigation into Russian interference into the 2016 presidential election. (You can locate these articles using the search engine at the top of the blog to locate articles about Robert Mueller.) The list of people he hired and the strong-arm tactics used against Paul Manafort are an indication that he had decided on the verdict before he conducted the investigation–much like his friend James Comey and the investigation into Hillary Clinton‘s emails. Well, this endless and wandering investigation may be called on to provide some accountability. 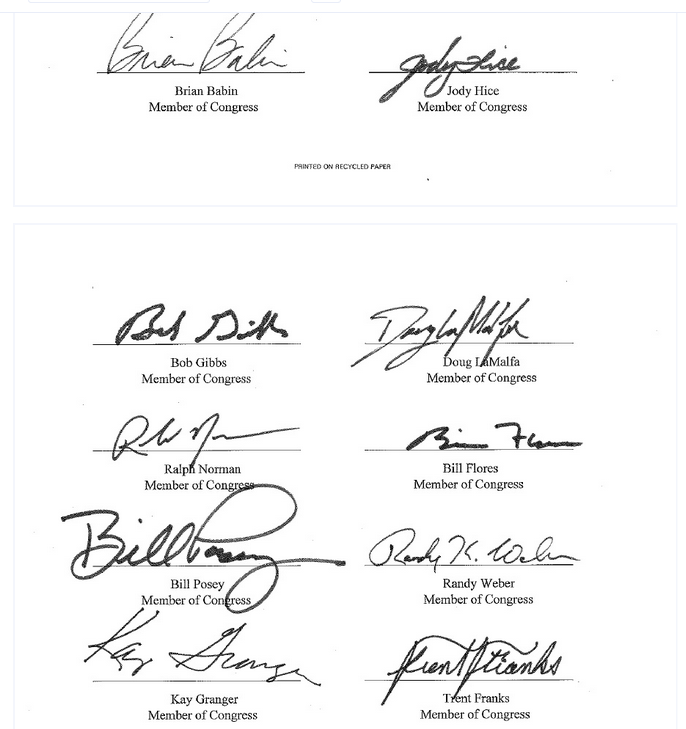 Yesterday The Gateway Pundit reported that nineteen Republican Congressmen have called for hearings on Robert Mueller’s investigation. It is definitely about time. Special Prosecutors need a deadline, a specific investigation subject, and a budget. 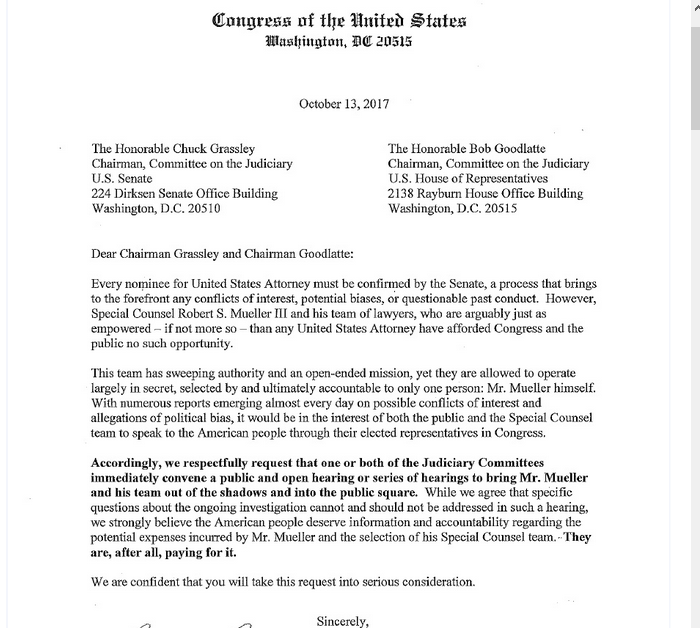 The abuses connected with special prosecutors are numerous. If Congress is unwilling to terminate the position, they should at least limit it. The following video was posted on YouTube on July 18th. It was posted in an article on the One America News website. There is a history of people closely associated with the Clinton family dying under mysterious circumstances. The expression “Arkancide” was coined to describe the mysterious deaths in Arkansas of many people who opposed the Clintons. The death of this man and the other deaths need to be looked at as part of a pattern.